When I lived in New York a little while back my first job (that wasn’t an unpaid internship) was as a Maître D at The Standard. To describe the experience as “never a dull moment” would be like describing a rockstar as celibate. Apart from countless nights filled with weird and wonderful shenanigans – the typical tomfooleries one might come to expect from a celebrity-riddled eatery – there was this one night in particular that has stuck in my head like a Dylan song. I was working the late night shift going about my usual business of dodging OCD managers, hiding glasses of juice the bartenders spiked with liquor, googling people who had bookings the following evening, bantering with the locals who’d had one too many drinks – when at approximately 2am, a strange lady wearing a vivid red coat erupted like a volcano through the door. She went straight to the corner table directly across from my desk and sat down in a heap. While waiting for her Scotch on the rocks, Red Coat Lady lifted up her bag, pulled out a large, slightly-decrepit sketch-pad and proceeded to draw on it incessantly, her only interruption being the dull clink of another round landing on her table. This went on for 2 hours. Last drinks were called and she finally rose up from her chair, scurried over to me and placed about 10 sheets of smudge-stained paper on my desk. I looked down at them, surprised, then looked up and she was gone. 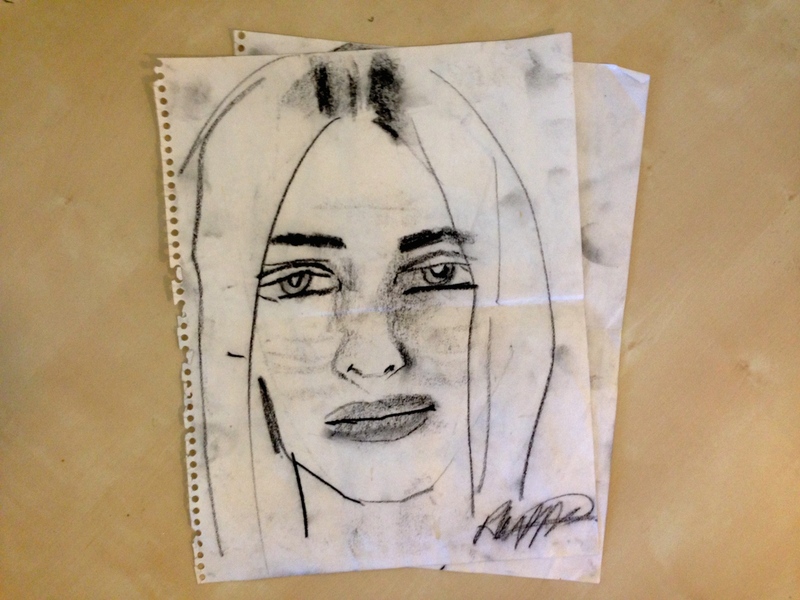 This is one of the 10 portraits she drew. I found out later that this strange red coat lady was a very prominent international artist, and she had hightailed it down to The Standard all on her lonesome after her solo-exhibition had launched uptown that very night. I guess she was over all the hangers on. I won’t tell you her name, but if you guess it from her signature then I’ll give you a gluten-free chic-chip brownie.